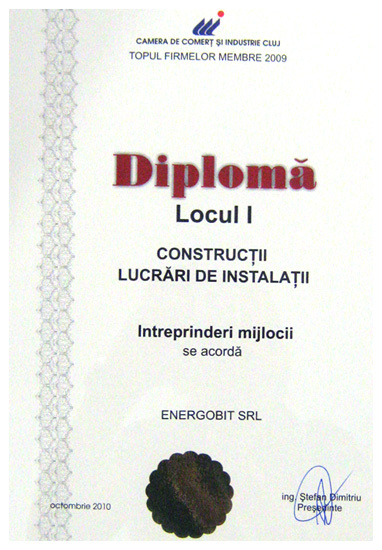 EnergoBit ranked 1st in the Medium Enterprises category of the Construction and Installation Works section in a top made by The Chamber of Commerce and Industry of Romania for the year 2009. The honorary positioning on top of this list confirms the upward trend of the Company’s activities in recent years. Thereby, EnergoBit has strengthened its status as the leading Romanian provider of specialized engineering and electrical works services in the field of wind farming. The company has completed a series of major works, from the projects whose beneficiary has been the electric power generation, transmission and distribution companies, to those destined for private employers and institutional investers. Partially responsible for the increase in the Company’s activity was the doubling of the production capacity of its factory from Jibou, a project that was completed during 2009. EnergoBit looks forward into the future with optimism. 20 years of activity, celebrated in 2010, affirmate the success of a business which grew 5 times bigger over the last 5 years. EnergoBit intends to keep this constant trend of growth in the future, through top equipment and services delivery, activity diversification, as well as the increase of the number of employees. – The completion of the lighting works for the Transylvania highway.